Our first multimedia project "Classics of Croatian Literature" has been rendered obsolete. We are no longer selling these products... And CD-ROMs as a medium are steadily vanishing to history. 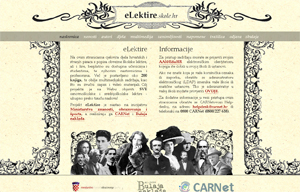 In collaboration with Croatian Ministry of education, science and sport and Croatian Academic and Research Network (CARNet) we are working on the project eLektire (http://lektire.skole.hr), and all of the content from the three CDs, plus many, many more, including numerous Croatian translations of world's literature classics, are now available to Croatian eucational community - free of charge. However, we will keep this page for, well, sentimental reasons... As far as we know, the "Classics of Croatian Literature" are and will remain the best selling Croatian CD-ROMs of all times! CD-ROMs "Classics of Croatian Literature"
The first thing we ever did - on three CD-ROMs we published electronic versions of texts of more than 200 works from the most famous Croatian literature classics, from Marulić to Krleža! In short, more than 30.000 pages of books! The CDs proved to be very useful and they were (and still are!) the national bestsellers in Croatia. They are popular tool that many people use at schools, libraries, for research purposes etc. The main advantage of this kind of CD-ROMs is the price - all three CDs together cost same as an average book on Croatian market, and for the price you get the valuable collection of literary works. "Classics of Croatian Literature I. - epics, novels, stories"
The first CD-ROM we did back in 1999 contains the integral versions of 67 most famous books by 34 authors, from Marulić's "Judita" and Gundulić's "Osman", to Mažuranić, Šenoa, Gjalski, Kovačić, Matoš, Šimunović, Nazor, Krleža, and many more. All the works are accompanied by commentaries and dictionaries. A short bio note is included for each author. "Classics of Croatian Literature II. - POETRY"
More than 5000 (five thousand!) poems, from The Middle Ages and Renaissance to Modernism! A selection of 70 poems is also available in audio format. "Classics of Croatian Literature III. - DRAMA and theater"
The third CD-ROM includes 107 plays by 38 authors, from the Middle Ages to World War II, which makes it the most extensive collection of Croatian plays ever published! The CD also includes 32 video clips from the famous theater performances, films and TV plays - more than 1 hour of video! - and an introduction to the history of dramatic literature and theatre with more than 400 photos and other pictures. All three CD-ROMs work on literally any computer, present and future (Windows, Macintosh, Linux...). The texts are available in HTML and PDF, audio files are in WAV or MP3 formats, and the videos are in standard MPG format and PAL resolution. The CDs also include advanced search option, and all the works can be read on screen or printed.